Just when you thought it was safe to go back into the water the first trailer for The Meg – a film about a giant prehistoric shark – has splashed onto the web. When a deep-sea submersible is attacked by a colossal 75-foot-long monster shark known as a Megalodon, disabling it and trapping the crew on the bottom of the sea, there’s only one man for the job. Expert deep-sea rescue diver Jonas Taylor, played by Jason Statham, is tasked with saving the crew by a visionary Chinese oceanographer (Winston Chao), against the wishes of his daughter Suyin (Li Bingbing). What no one realises however, is Taylor has his own horrible history with the deep sea beast, and this journey will see him confront his fears and risk his own life to save everyone trapped on the ocean floor. 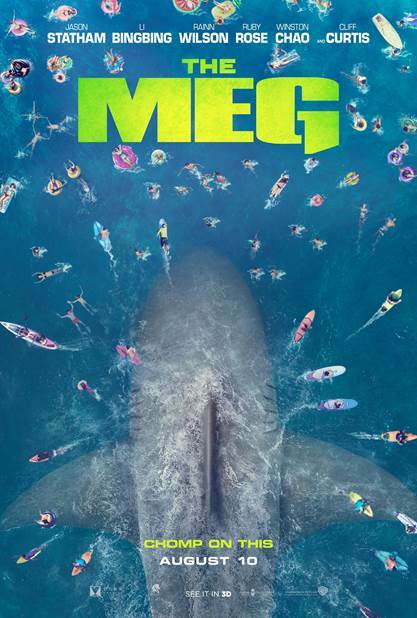 The Meg boasts a stellar cast from around the world including; The Office‘s Rainn Wilson, Ruby Rose, Winston Chao, Ólafur Darri Ólafsson Sophia Shuya Cai, Masi Oka and many more. The film is based on the best-selling novel, Meg: A Novel of Deep Terror, by Steve Alten and is directed by Jon Turteltaub, who directed the greatest unfinished franchise ever, the National Treasure movies. On the early stages of the prep, we took a trip to Fiji, and we went diving with some bull sharks. They hand-feed them and it’s a spectacular thing to see. These things are three meters in length, huge big things. There were 20 or 30 of these things, and they were hand-feeding (them) big tuna heads, and we got very, very close, and it was a spectacular moment. To swim in close proximity to a big, three-meter shark, is to be recommended to all and everyone. The megalodon may sound like a creature conjured from the imagination of a particularly aquaphobic writer but it’s actually a terrifyingly real sea monster. The beast, whose name means big teeth, was enormous, with some scientists estimating these sharks could have been 79 to 82 feet long when fully grown. In their mouth, they had razor sharp, seven inch long teeth, for ripping through the flesh of their prey – not that they needed them with a mouth estimated to be two metres wide. Thankfully, the creature went extinct millions of years ago, or so scientists think – there were sightings of larger than average sharks being seen in deep waters back in the Nineties. So who knows, maybe The Meg is based on a horrible true story?.. The Meg opens this summer, beginning August 10, in 2D and 3D in select theatres and IMAX.